All REVO wings are strut braced and rated to +6Gs -3Gs. All wings can be folded on the trike without ever removing the wing. "I can't believe how easy it rolls for such a big wing." The 31.5' spanned 2017 RIVAL X 14.0 meter wing is the big brother to the RIVAL S. Keeping the best of small wing qualities while adding large wing capabilities best summarizes this wing. Attributes normally associated with larger wings such as stiff, sluggish controls and additional work in turbulence have been eliminated entirely! Easy for novices to fly, but seasoned trike pilots will love the handling as well. It is the product of nine years of R&D and now our Flag Ship model. The RIVAL X has all of the design features of the RIVAL S plus Long, flat, power off glides to landings with more float time. Less pilot input in the bumps than our other models while retaining the same light roll pressure of its smaller siblings. Using the same RIVAL S sail cut, the unique high twist tips command its roll authority. Our fully adjustable Roll Damper allows the wing to use pendulum effect from the hanging carriage for roll stability while reducing carriage swing at the same time. The special VATS (Variable Anhedral Trim System) trim system increases rear flying wire tension in faster trim speeds which reduces keel shift. This system removes the “sweet spot” or trim speed the wing handles best. Therefore, roll pressure and sensitivity remain consistent throughout the entire speed range of 50-90 MPH. "I was totally blown away by the handling and the performance." The 29.5' spanned RIVAL S is a 12.4 meter wing originally developed in 2013 and then updated again in 2016. Surprisingly agile, Experienced trike pilots will love the effortless rapid roll rate even loaded at full gross (1160 lbs). It is the product of six years of R&D specifically targeting light handling, speed wings that penetrate turbulence almost effortlessly. Some previous prototypes include the “Blue Devil wing” seen here. The RIVAL S has a special designed undersurface keeping the center of the wing, which makes 90% of the lift, low twist for maximum efficency. Then the outboard section of the undersurface is detached allowing the wing to twist and billow Very heavily. This effect improves yaw stability, pitch stability, roll rate, decreased control forces and remarkable stability at high angles of attack. Our unique fully adjustable Roll Damper allows the wing to use pendulum effect from the hanging carriage for roll stability while reducing carriage swing at the same time. The special VATS (Variable Anhedral Trim System) trim system increases rear flying wire tension in faster trim speeds which reduces keel shift. 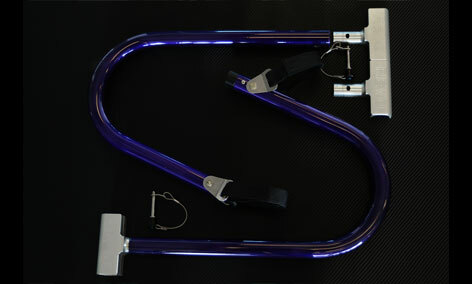 This system removes the “sweet spot” or trim speed the wing handles best. Therefore, roll pressure and sensitivity remain consistent throughout the entire speed range of 55-100 MPH. "Had my Discovery up to 15,400 feet today over Pikes Peak"
The 31.5' spanned Discovery 13.5 meter wing was developed in 2008. It is a well mannered, highly efficient and proven wing. Although a 13.5 square meter wing would be considered small if it were a king posted, high twist wing, the Discovery is a modern low twist, strut braced wing which is quite large for its class. This large wing is suitable for high altitude operation (7000' + MSL airports) and for short takeoffs on less than perfect soft-fields. Hands off cruise speeds are 55-80 MPH. The Discovery 13.5 makes an ideal first wing for a novice. Its larger size is best suited for calm to moderate conditions, but it can handle more severe conditions which simply requires more physical effort to fly in. The Discovery comes standard on the REVO with no upcharge to fit this wing. It flies very "typical" in that its roll rate and control bar feed back is a very familiar feeling. This means transition training is generally not required. Perfect for those that do not crave the effortless extra light, quick handling of our smaller performance wings. The Discovery 13.5 delivers easy flying without the sacrifice of performance. For an additional charge the Discovery is upgradable to include the CNC hang block, with patented roll damper, Vortex generators and speed valves which are standard on the RIVAL S/X and Competition 11 wing models. "Sensitive responses felt like flying a jet fighter..."
The 27' spanned Competition is a 10.9 meter wing designed for advanced trike pilots. This wing, like the Discovery, was developed in 2008 and has become a favorite among advanced trike pilots flying them all over the world. The Competition 11 dominates when it comes to effortless roll authority with the fastest roll rate in the industry of 90 degrees per second. New and improved for 2013 is the VATS trim system, also used in the RIVAL S. VATS increases stability at high speed eliminating the need for winglets while also increasing slow speed maneuverability. Now with VATS, a 100 MPH trim speed, turbulators and speed valves this wing is "hotter" than ever. The Competiton 11 is recommended for intermediate to experienced pilots only since airspeed must be managed more critically on landings. In the air it is possibly one of the easiest wings to fly. Extremely precise and incredibly unaffected by high winds and turbulence. Its small area lends itself to being a phenomenal cross-country wing that can handle much more than many larger wings and will do it all while traveling faster. However handling is best when 1 up and in 80+ MPH trim settings. By comparison the RIVAL S/X fly exceptional at all trim speeds and all weights, but cannot compare in high turbulence to the micro sized Competition 11. "What a Blast to fly!..." The 28' spanned RASCAL is a 12.0 meter wing originally developed in 2018. It is surprisingly agile, can handle real mid day conditions and has a fairly short take off distance even at full gross. The RASCAL is a micro sized quick folding single surface wing with huge benefits of higher wing loading. 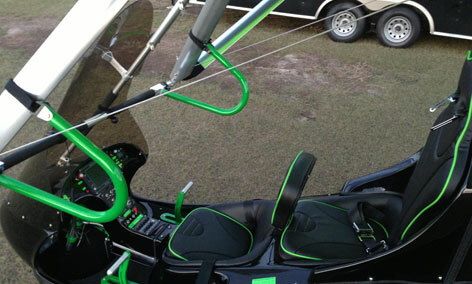 This translates into more capability in turbulence and lighter, faster controls. Shifting A frame geometry with rear tension equalizer make this wing extremely smooth in roll and very fun to fly. Sink rate is surprisingly slow, while climb rate has a slight penalty to its bigger brothers the 15 and 17. For those that want the quick fold ability with double surface capability in the wind, the RASCAL delivers. "My favorite all around wing"
The 31.5' REVOLT 15 is based on the 1999 design of the Legendary Mustang 15. While the name has changed as the wing has evolved over the last 2 decades, it has continued to be a top selling wing. Now with new hardware, combined with the latest technology in airfoils, shifting A frame geometry and turbulators, a Classic, best in class, wing has evolved to a new level. The REVOLT 15 is possibly one of the best all around wings on the planet. Although it is not very fast, it can be flown mid day, low and slow, and folds up almost effortlessly like the RASCAL and the REVOLT 17. Light roll pressure and medium roll rate make this wing very easy to fly although it is better suited to winds below 15 MPH. "Slow enough to enjoy the wind in your face"
The 33.5' REVOLT 17 is based on the 1999 design of the Legendary Mustang 17. While the name has changed as the wing has evolved over the last 2 decades, it has continued to be a top selling wing. Now with new hardware, combined with the latest technology in airfoils, shifting A frame geometry and turbulators, a Classic, best in class, wing has evolved to a new level. The REVOLT 17 is a slow flyer. For those in search of a true "wind in the face experience", this wing delivers. Although it is best suited for morning and evening flights, experienced pilots can fly it mid day thanks to its light controls. It folds up almost effortlessly like the RASCAL and the REVOLT 15 with just a couple extra battens. The 31.5' spanned, performance RIVAL X 14.0 meter wing is the big brother to the RIVAL S (not available on the REVOLT). Easy for novices to fly, but seasoned trike pilots will love the handling as well. It is the product of nine years of R&D and now our Flag Ship model. The RIVAL X requires less pilot input in the bumps than our other models and a MUCH wider speed range. The special VATS (Variable Anhedral Trim System) trim system increases rear flying wire tension in faster trim speeds which reduces keel shift. This system removes the “sweet spot” or trim speed the wing handles best. Therefore, roll pressure and sensitivity remain consistent throughout the entire speed range of 50-80 MPH. 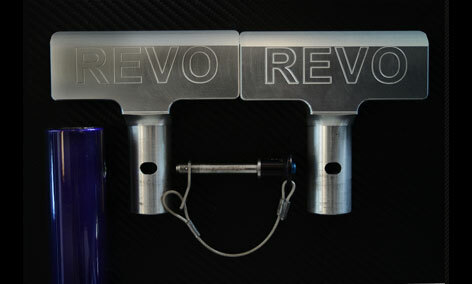 The REVO trainer bars consist of a clam shell CNC control bar clamp allowing the pilot to remove the trainer bars in under 30 seconds.This unique design does not require disassembly of the wing. These quality trainer bars are extremely rigid and finished in a gloss black powder coat with optional custom colors available.